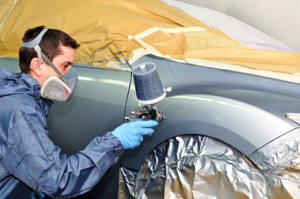 Repair Process : Columbia Auto Body | family owned and operated since it opened in 1982, and since then has grown to be a fully equipped and high quality collision repair facility. Keeping a business not only up and running, but also thriving for over 30 years is a huge task, and it could only be done by servicing customers with quality work. 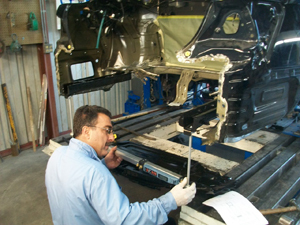 Our Unibody and Frame Repair Facility features the modern technology needed to properly repair your vehicle.We utilize the “Hook” frame straightening rack and Chief Precision Specifications to correct the dimensional inaccuracies caused by the collision. We are equipped with a CompuSpot 500, which is a factory authorized compression welder. 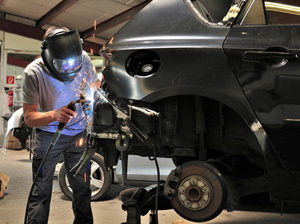 It allows us to produce factory-like welds on all body and structural parts. Using your vehicles VIN, we guarantee a perfect color match. We proudly use Axalta Chromax Waterborne paint, which is eco-friendly and matches the factory finish. We only use products that meet or exceed the manufacturer’s specifications and are backed by a lifetime paint performance guarantee. Vehicles today have more technology and electrical components than ever before, such as Adaptive Cruise Control, Forward Collision Warning, Lane Departure Warning, Blind Spot Detection, and many more. It is necessary in most repair situations for the vehicle to have a pre- and post-repair scan so that we are informed of any trouble codes present, even in cases where there are no identifier lights on the dash. 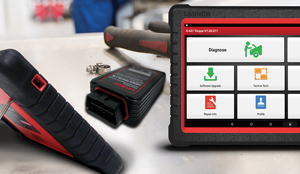 Using our LaunchTech X-431 scanning tool, we are able to diagnose and reset trouble codes caused by the collision. At times the above vehicle safety systems will also have to be Recalibrated after repairs so they will function correctly.